In the last 3 years, prosecution of fisheries infractions and enforcement of fisheri es laws have witnessed significant improvement, thanks to donor supported initiatives aimed at promoting compliance and enforcement, including the BUSAC funded project to address illegal fishing through education and sensitization. However, gains made over the years relative to compliance and enforcement risk being eroded by political interference, especially during this election year. Promises being made by political actors are compromising enforcement actions and also weakening fisher folk compliance with fisheries regulations. During follow-up meetings with personnel of the Fisheries Commission at the regional level, it became known that offenders of fisheries laws are making demands for confiscated gear such as generators and fishing nets to be given back to them. 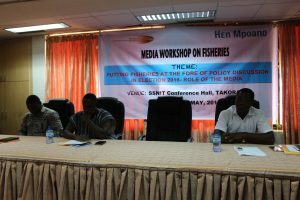 In fishing communities, notably Elmina and Sekondi, it is widely perceived that some politicians are orchestrating and supporting such behaviours under the pretext of protecting poor fisher- folk livelihoods. If this tendency continues unchecked, it will cascade into widespread illegal fishing activities with potential deleterious effect on marine fish stocks which are already on the decline. Furthermore, the Fisheries Commission has formulated and adopted a management plan that calls for series of management measures to help rebuild the fishery. These include seasonal closures, additional fishing holidays, control of new entrants into the fishery, co-management of the resource etc. Many of these management measures and other reforms identified in the management plan are yet to be implemented to the letter. On the contrary, policies that fuel increased fishing pressure and overexploitation of stocks – distribution of outboard motors and other fishing inputs – have recently become the centrepiece of government support to the fishing sector. In addition, many fishers are of the opinion that light fishing and use of monofilament rubber nets are not the major causes of the decline in marine fisheries resources as compared to fish transhipment (Saiko fishing). One of the lessons Hen Mpoano learned during implementation of the IUU/SAIKO fishing project was that it is insufficient to focus on one aspect of illegal fishing – SAIKO – while other practices degrading fisheries resources – light fishing, chemical fishing, small mesh sizes etc. are not targeted. Hen Mpoano also learned that there is the need to target all fleets; canoe, trawlers and semi-industrials and related stakeholder groups involved in the SAIKO chain in order to find lasting solutions to the issue of fish transhipment. The just ended project on SAIKO fishing made use of the media to communicate some of the key messages to the general public. However, this was limited to a few media outlets. 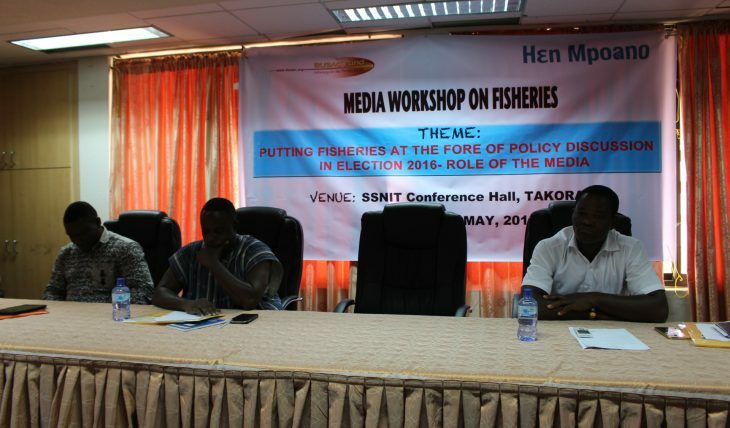 Furthermore, media personnel were not given enough orientation on the dynamics of IUU fishing activities. Consequently, this project will draw on media publicity as well as stakeholder engagement and message development to bring illegal fishing issues to public attention and incorporate fisheries reform into political discourse during this election year. To increase media attention and stakeholder engagement on fisheries in the lead up to elections.